A previously unpublished interview transcript has revealed heartfelt advice Gordon Banks offered to a young goalkeeper he had never met. The World Cup winner offered the words of wisdom “not just for football but for life” during an interview with a journalist at the Leicester Mercury nearly 10 years ago. Lee Marlow shared the transcript on Twitter on Tuesday after news broke of Banks’ death at the age of 81, saying it had been pinned to his son’s wall for the last seven years. “God bless you, Gordon Banks,” Mr Marlow wrote in the caption. 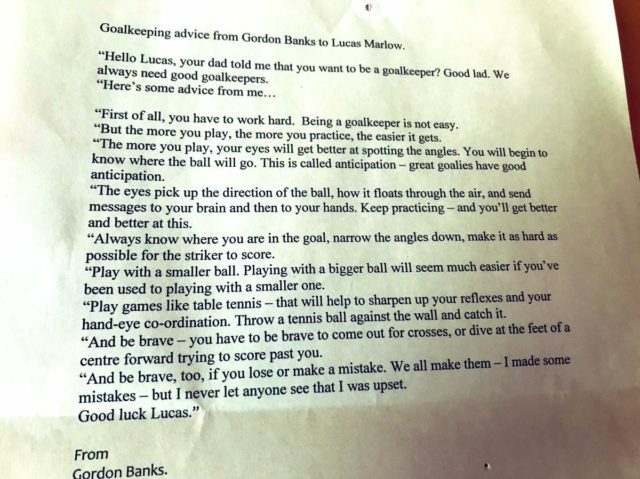 Lee Marlow shares on Twitter the transcript he wrote up of Gordon Banks’ advice to his son Lucas when the latter was a burgeoning eight-year-old goalkeeper. In the transcript Banks encourages the eight-year-old to train with a smaller ball, as “playing with a bigger ball will seem much easier” and test his reaction speeds with table tennis and tennis balls. The former England international, who won 73 international caps, also tells Lucas to keep practising as “the more you play, the more your eyes will get better at spotting the angles”. “You have to be brave to come out for crosses, or dive at the feet of a centre forward trying to score past you,” Banks said. “And be brave too, if you lose or make a mistake. The transcript did not make Mr Marlow’s final article for the local paper and he instead wrote it up for his son to put on his wall. “This morning when I heard he died I checked and it’s still there on my son’s cork board,” the 48-year-old told the Press Association. “The transcript tells us he’s a decent, down-to-Earth and lovely man really. He showed a genuine interest. “He didn’t have to say all that, this World Cup winner, but he took the time to give advice to an eight-year-old boy he never met, and it’s a testament to the man. Mr Marlow said his son, born in 2003, was not sure who Banks was when he first gave him the transcript so showed him some classic footage, including the goalkeeper’s memorable save from a Pele header at the 1970 World Cup in Mexico. “We watched it over and over again and my son asked ‘how on Earth did he save that? '” said Mr Marlow. “I said it’s because he was the best goalkeeper in the world son – and this is his advice to you. “After that letter he got to know all about Gordon Banks. I remember he made a save once where he managed to tip a low shot over the bar. Lucas is now 15 and is still a goalkeeper, now playing for his local Whitwick Under-16s side. Mr Marlow, now a journalism lecturer, added that he had been nervous for his interview with Banks.